Marblesoft and AIMEE Solutions are pleased to announce their collaboration on a new series of early literacy programs for children with special needs. We took the AIMEE Solutions series of fun and educational stories and early reading activities and added Marblesoft's flair for creating great, easy-to-use accessible programs. The result is the Click To Read series. 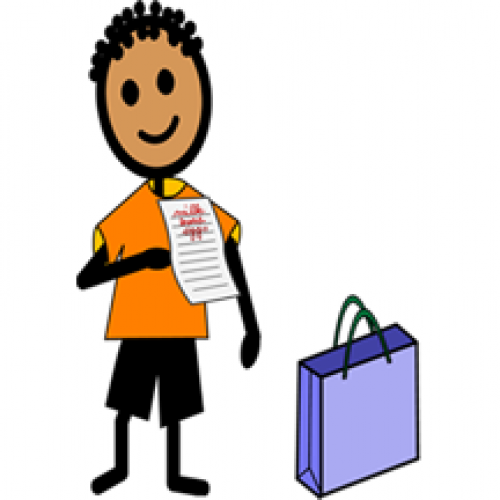 The first in the series is Click to Read: Life Skills, consisting of four entertaining, colorful, related stories: Ben Goes Shopping, Community Signs, How Much Is It Worth? and What Time Is It? Each story uses SymbolStix to build vocabulary, encourage early literacy and support comprehension. Students can hear the story read to them in a cause and effect mode, expand meaning of text and picture symbols in an interactive mode, and can then demonstrate their understanding by arranging the symbols to retell the story in any of three reading levels. Each story also comes with three Show What You Know activities - Bingo, Concentration and Vocabulary practice. Students demonstrate their understanding of the core vocabulary by using the symbols to play at different reading levels.